There is no question in my unbiased mind that our bridges on the Thames are the most interesting from an engineering point of view as well as being the most photogenic, and with magnificent variety. If you agree with me, you’ll love this new free exhibition at Museum of London, Docklands. Joseph Farrington, drawing; ink; wash-View of London Bridge from the South West, 1789. Museum of London. For centuries, central London had but one bridge which joined Southwark to the City. Our next crossing point upriver was miles upstream in Surrey at Kingston. Then Westminster Bridge came into being in 1750 and the City – not to be outdone – threw up Blackfriars Bridge in 1766. From then on, there has been no stopping us. Not only do we add extra crossing points frequently to this day (with the Garden Bridge in the immediate pipeline), we seem to like bashing down, extending, widening and rebuilding existing ones. Hence our oldest surviving bridge is the exquisite stone crossing at Richmond from 1780. All the others are relatively much newer. Apart from a large oil of Waterloo Bridge and a few panoramic items, most pieces in this exhibition are quite small, and some very small indeed. There are photographs, oils, etchings, watercolours, pen n ink, engravings. 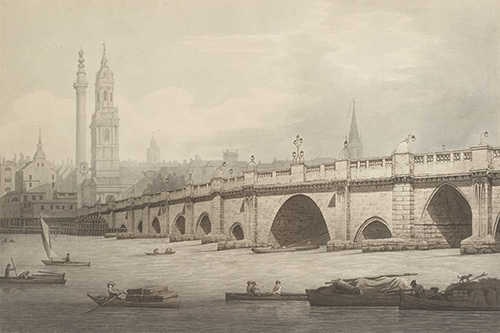 Highlights include a depiction of Blackfriars Bridge under construction by Piranesi, who never actually visited London, but had met the bridge’s designer, Robert Mylne; an ancient 1840s photograph – the oldest in the museum’s collection – of Old Hungerford Bridge, by William Henry Fox Talbot. There is a gorgeous canvas of Waterloo Bridge (1821) by Charles Deane – the viewpoint is from Lambeth and it features watermen, Thames barges and lighters in the foreground. Old Waterloo Bridge features a lot in this show; I was quite taken by the 1930s demolition photographs by Albert Linney, cited by some as vandalism by Herbert Morrison and leading to the dull but worthy bridge we know today, largely constructed by women during World War Two. 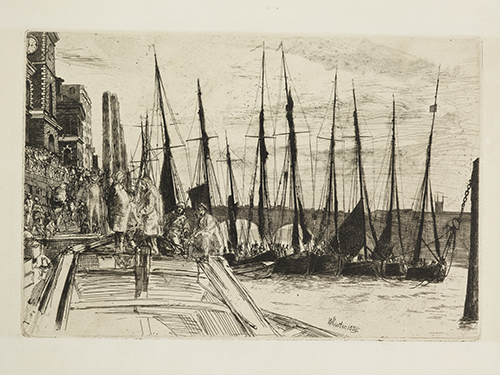 My favourites, though are featured in this post, two series of images: four river views in pen and watercolour by Joseph Farringdon from 1789/90; and three etchings by James McNiell Whistler from around 1860. The Museum’s Estuary show last year featured at least three or four fascinating film installations. Bridge has just the one – by an artist who featured in Estuary: William Raban. 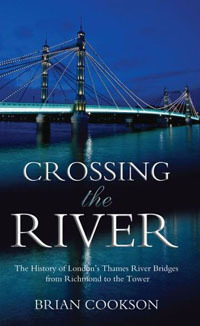 This film, Beating the Bridges from 1998, takes us on a boat journey downstream through Westminster, the City and down the estuary. His filmaker’s eye shows us detail most of us miss; much of the trip’s soundtrack is provided by an in-shot jazz drummer on the boat. So it’s a work with a twinkle in its eye. Billingsgate. Whistler, James Abbott McNeill -1859-print /etching published 1871. Museum of London. Old Hungerford Bridge. Whistler, James Abbott McNeill-1861. Museum of London. Old Westminster Bridge. James Abbott McNeill Whistler,1859. print; etching and dry point. Museum of London. This is a wonderful show which you must see. I bet most of you reading this have not been to Museum of London Docklands yet. Until early last year, I was in the same shameful position. Regardless of this lovely exhibition, everyone should visit the superb institution on its own merits. A short walk from Canary Wharf or West India Quay on the DLR, it’s really easy to get to. And free. 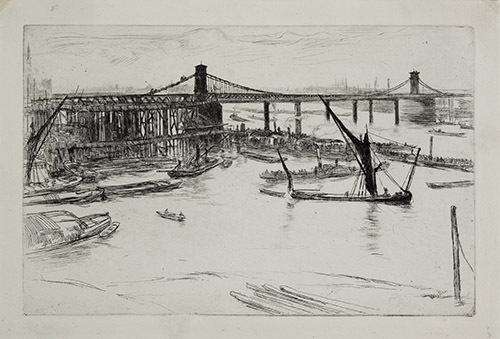 Bridge at Museum of London, Docklands runs until 2 November 2014. London Historians’ Thames bridges album on Flickr.